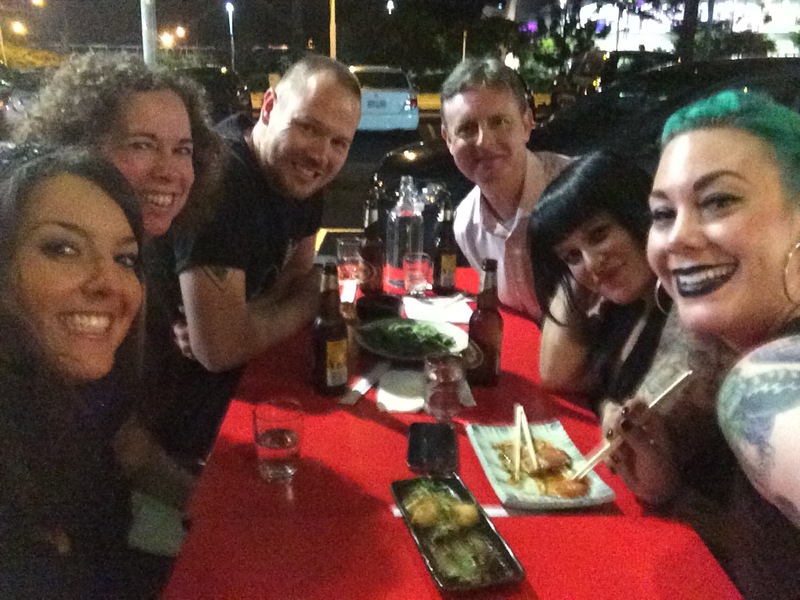 Rather than doing a gazillion different blog posts (or, okay, four) about the Supanova tour I’ve just finished, I figured I may as well do my debrief in one massive post… So nuke some popcorn and put your feet up, because this blog has everything from videos to audio files to pics and plenty of words. Ready? … Here we go! And this is from Sunday: me with my new buddies from The Lord of the Rings, me with Maria V. Snyder, and then a pic of me giving my allocated 2 minute “rant” that I spoke about in my vlog regarding the tropes I’m sick of reading (I said love triangles as well as romance that overtakes the plot and ruins the fantasy adventure). As for Melbourne, no vlogs, sorry. But I’ll still go into detail with words and pictures, as well as mini video clips and even a voice recording! Consider this as an almost interactive blog where you can act like you where right there alongside me! FUN TIMES! 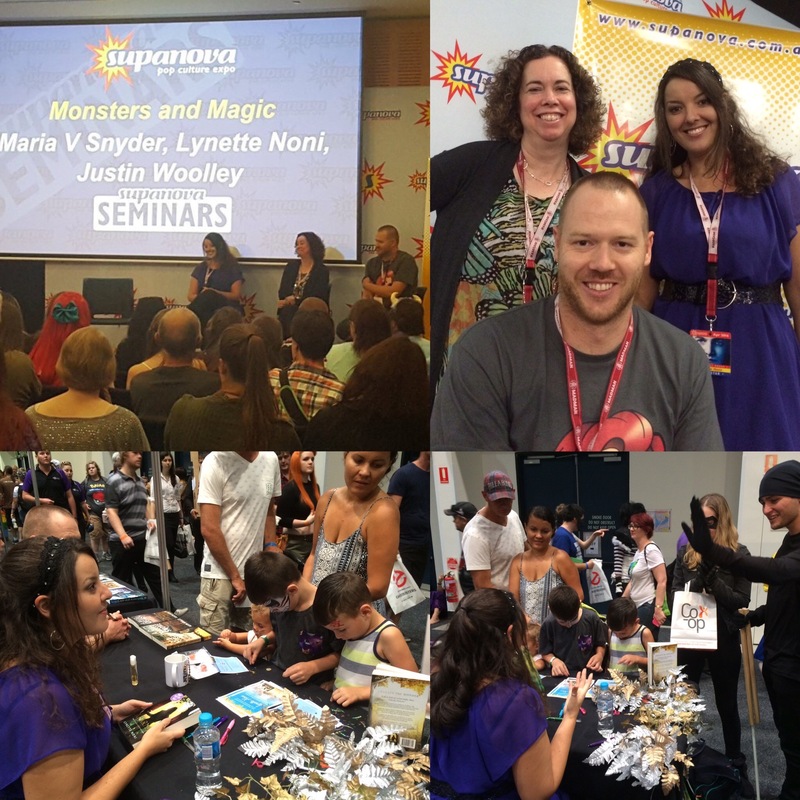 Basically, the second half of the April 2016 Supanova was, if anything, even more epic than the first half. Most of that was because we all ‘knew’ each other by then, so coming back together after a few days apart had the same kind of feel as a family reunion. Here’s a pic of all us authors after the wonderful literary manager, Ineke Prochazka—HUGS INEKE!!!! !— gave us gifts that she made herself!! She gave out little mini Deadpools and Harley Quinns (I got Harley – woohoo!). For me, the weekend kind of began on the Thursday when I travelled to Brisbane to give two writing talks to students at Everton Park State High school, then I went straight to the airport to fly to Melbourne. From there I taxied direct from Melbs airport to Readings Bookstore in St. Kilda (which, coincidentally, the day before won the title of “International Bookstore Of The Year” – CONGRATS READINGS!!!!). At Readings I was on a ‘Diversity in YA’ panel with fellow Pantera Press author, Wanda Wiltshire, and the wonderful moderator Isabelle Moore. We had a great chat for a couple of hours and then it was off to my hotel after surviving the first of many looooooong days. After that, we headed back to the hotel and had lunch (aka the BEST burgers IN THE WORLD), and then I headed on over Dymocks in Melbourne City and signed a mountain of books (FUNNNNN!!!!) and then went to the State Library of Victoria to meet with some people… and then afterwards there was an interview… Aaaaand I’m being vague on all details listed here since I’ve just realised I can’t recall what can and can’t be said… Gah! Too much to remember! But when that was all done, I hurried back to the hotel to freshen up before jumping in the Supanova bus and heading to the showgrounds for the opening ceremony. Before anything began, Maria Lewis and I were waylaid to do a Supanova Television interview, which was really cool! After that was done, I jumped on stage with the other authors to answer individualised “Would You Rather” questions (mine being “Would you rather swim with Ariel or fly with Peter Pan?” – to which I answered flying with Peter because, well, FLYING!!!! Plus, as enjoyable as it’d be to hang with Ariel, I can’t breathe underwater! )… And after we’d all given our answers, we were then ushered off to our “What Have You Been Reading?” seminar to do a repeat of everything we said at the Gold Coast the previous weekend. After that we bussed back to the hotel and a few of us went out to dinner, and then after that I hung out in the bar of the hotel with Ineke and Christopher Judge (Stargate), along with a number of come-and-go people who came-and-went over the course of a few hours. We were out probably until after midnight before I called it a night, knowing that the next few days would be epic and I needed to at least try to get some sleep. Saturday morning was go-go-go as we were again herded off to the showgrounds, the whole group of us this time. Again, it was nice to see those who I hadn’t seen for a week – that family reunion feel still going strong. Saturday was full of signings and laughs and good times, and I got to see some of my FAVOURITE readers who all came along as a group – most of them only meeting each other for the first time that weekend! After the con was over and most people had said goodbye and dispersed, something incredible and definitely unexpected happened on the Sunday night. 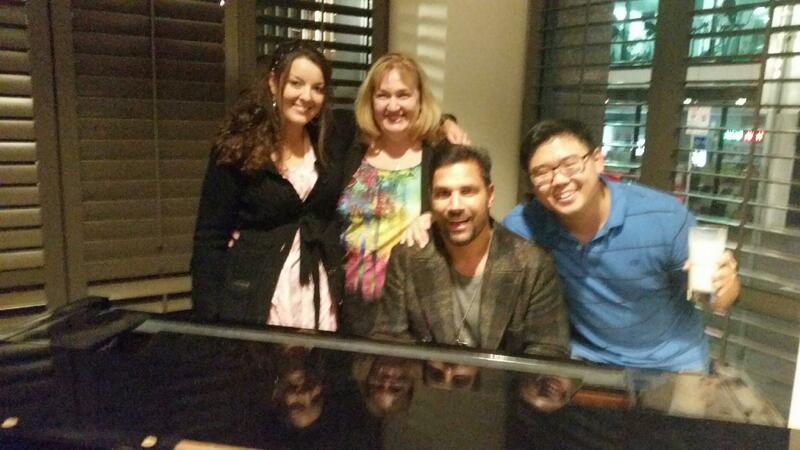 Those of us who remained ended up settling down in the lobby of the hotel and we were treated to what can only be described as a magical solo concerto by professional pianist Jonathan Ong. Words simply cannot describe the talent Jonathan possesses. All I can say is that he’s some kind of genius musical prodigy. He was taking requests, and if he didn’t know the song, all he had to do was listen to it once before playing it himself and turning it into some kind of musical masterpiece (and he didn’t even need to listen to it the whole way through!!). Thankfully, despite how entranced and hypnotised I was, I still managed to capture some parts on video, which I’ll add with explanations below. Jonathan was seriously the nicest guy ever, and he indulged me a number of times for Disney songs that he played in the most incredibly beautiful ways possible. With those melodies and others that he gave us, many people were brought to tears. And also another MASSIVE, HUGE, GINORMOUS THANK YOUUUUUU to all the staff and volunteers of Supanova Expo for making it into the wonderful event that it is, and therefore making it the BEST EXPERIENCE EVER!!!!! Oh! I almost forgot to mention! 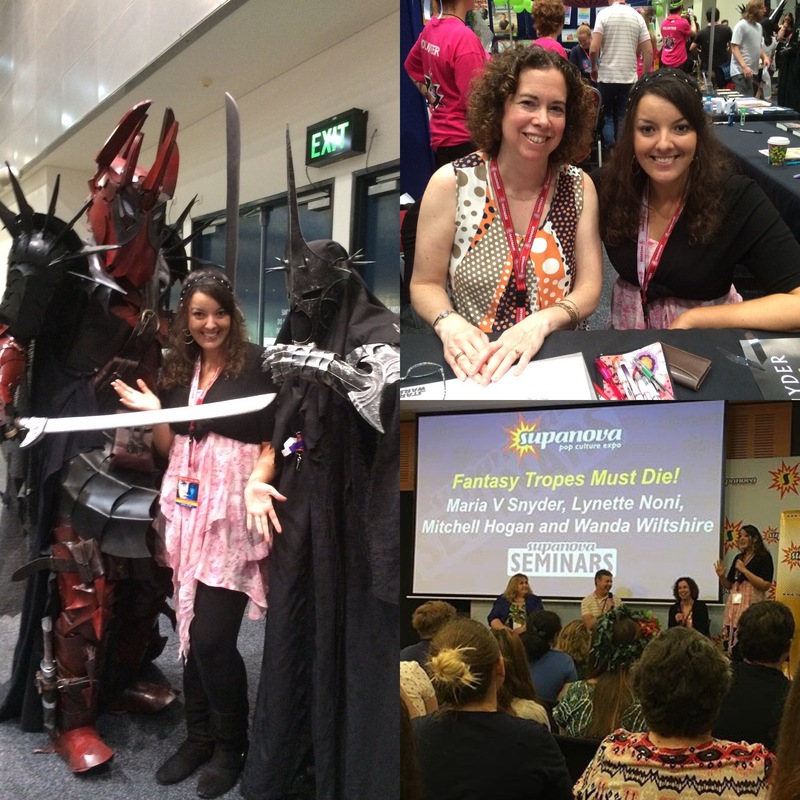 Akarnae and Raelia took out the top two spots for ‘highest selling single title’ at Gold Coast Supanova! HOW AWESOME!!!! Massive thanks to all of you again!! !